Certified Safe: The Night Light USB Charger with ETL Certificate , Adopt Fire-proof Material, Upgraded Hardware Ensure Complete Protection when you use it. NIGHT LIGHT WITH ON/OFF SWITCH - Just need to press the ON/OFF switch to turn on the night light when you want to use it. ETL CERTIFIED DC 5V 2.1A - Two usb ports output, allows full speed charging for 2 smart phones or 1 tablet. DUAL USB WALL CHARGER - Wall outlet with usb ports, Compatible with all 5V devices, such as iPhone, iPad, Android smart phones, tablet, camera, PSP,etc. SAFETY ABS + PC MATERIAL - Built-in intelligent circuitry and durable ABS material ensures safe use for all your devices. Multiple protection systems provide device safety for protection from over-charging, over-voltage, over-current, over-temperature and short circuiting. 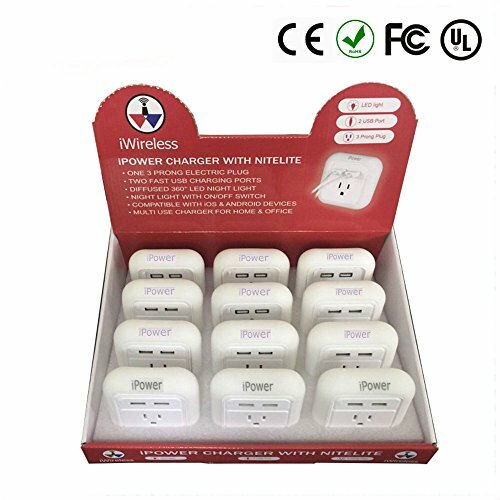 If you have any questions about this product by iWireless USA, contact us by completing and submitting the form below. If you are looking for a specif part number, please include it with your message.